i added some photos to my travel journal a few weeks ago and finally used my iphone this weekend to film a flip through of the entire book. if you subscribe to my youtube channel you may have already seen the other video i uploaded this week. 2 in 1 week. i’m on a roll! now it’s finished and i can put it up on the shelf with the others. school is in full swing and i’m busy in the classroom getting to know the new children with whom i’ll be spending the next 165 school days. i’m sure i’ve said it already, but they are a good group. back to school night was saturday and one of the parents brought me a box of delicious chinese buns. i’ve never been at a school before where the parents are so pleased that you are their child’s teacher. having been at other schools where this is not the case at all, i am once again reminded of how lucky i am to have landed where i did. i’ve only completed a handful of sketchbook pages since school started, but i keep at it. bit by bit through the slow times. the expanding catalogue of my life. since i found A JOURNEY TO VENICE in my bookcase i am enjoying copying some of the images into my own sketchbook. great practice! i’m taking a very special winter trip this year back to that magical place i visited once upon a time. this time i’m going with dottie & christy. i’ve been pulling my old venice books off the shelf including my old 2012 travel journal. reaquainting myself with my maiden voyage to venice 6 years ago. i especially love studying my old maps. we’ll be staying in dorsoduro the same quiet neighborhood where i stayed before. the thought of boarding the empty winter vaporettos fills me with pleasure. as does the memory of the old bookstores i will revisit. …is a terrific example of why we love these stories of man-against-nature. But it also aspires to be something more. It has the requisite cast of explorers attempting to survive in the uncharted and inhospitable Alaskan wilderness in the late 19th century, but it is also lush with magical realism. It’s 1885, and Col. Allen Forrester has been asked to lead a small, motley crew of soldiers, trappers and Native Americans up the uncharted Wolverine River and cross Alaska in the winter. He is a newlywed, and his young wife, Sophie, will remain behind in Oregon. i was planning to wait till i had finished to begin A ROOM WITH A VIEW, but i’m afraid i couldn’t. i’m in a reading trance. i can’t wait to fall into bed an hour early each night and slip into another world in the wilds of alaska or the wonders of italy. VENICE is a bit plodding and heavy , but so far i haven’t abandoned it. CIDER WITH ROSIE is at once lyrical, tender, at times disturbing. i find myself laughing out loud and pulling over often to bookmark a particularly beautiful passage. if you are a lover of words and language you will enjoy. laurie lee is the narrator and his old man voice is rich and wonderful. Me again. (Waves) how did you get the pockets in your book? I think of you often. We never met, and yet I spent a great deal of my childhood with you. This video was a beautiful reminder why. Your video has me jonesing for a beachy road trip when I’d sworn off them for awhile. Dang it! What program or app do you use to put together your video? I’m preparing an annual video for my family and every year there’s a it of panic as I realize I need to burn it to cd. I use Final Cut Pro X which I have for editing my online classes, but I used to use imovie which works great too! Most macs don’t have cd/dvd drives anymore. Have you considered just uploading it to Vimeo or Youtube and making it private? Everyone would have access from any device including cell phones and wouldn’t need a cd drive. Just an idea. Mary Ann, I enjoyed your travel journal so much! I especially love the little sketches of the food packages and the clothes you packed. And I’m so excited to hear your reports from Venice. So happy for you to return to that magic place! Gorgeous journal Mary Ann! I wish I had an ounce of your talent! Looks like it was an awesome trip! Wish you all the best in your new school year! thanks jane. I bet you have way more than an ounce! My husband and I are considering using my 3 week school break at Christmas to visit Rome. We are excited about the possibility. The last time I was there was 40 years ago! My hubby has never been. sounds incredible. a winter trip to rome… i like the sound of that. Your travel journal is spectacular. I love how the majority of images are paintings. Thank you for sharing! I am putting Bavaria and Venice on my “to visit” list. My next trip, however, is Costa Rica with students. hey thanks kristi! costa rica….sounds wonderful. i wonder how old your students are…? How exciting to go to Venice again. I just love my Murano glass necklace and earrings I got there, near the Rialto bridge where I stayed. I can hear the church bells ringing. Just loved your video beginning to the flip through of the Bavarian journal. Which Stillman & Bern (alpha, beta, zeta?) journal did you use? We got lost in Venice, which everyone says you must do. We got dropped off by boat from a trip to Burano over by St. Peter’s square and decided to get off the main “tourist trail” from St. Peter’s to the Rialto bridge. We loved poking in neighborhood’s and seeing people bringing their children home from school in the afternoon. We eventually found our way again and got back to our hotel. We went two years ago. how lovely your trip must’ve been kate. i can picture that walk you took in my mind. my sketchbook was a DELTA! hee hee! you’re scaring me. not sure if i can wait! Your posts, as usual, a balm to the spirit. 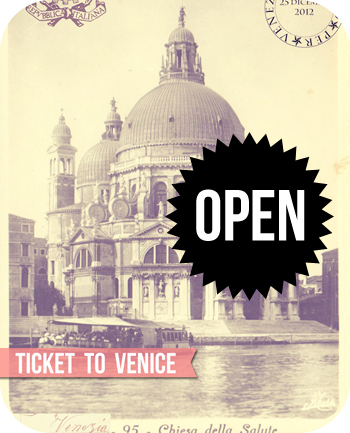 Ticket to Venice feels like a long time ago; loved that class. I think I might have to re-enroll in that one as I never did finish it. So glad you’re going back; I remember the wonderful music that you put with the videos, haunting and so emotive! I just returned from a week in France; the Bordeaux region on a river cruise boat (seriously I was the youngest person on there apart from a couple of grandchildren- and I’m 51. I was only the non-French speaker, and it was glorious! Lots of halting, short, but very sweet conversations “Je m’apelle Jane, j’habite en Etas Unis, en Floride…” and then lots of smiles, because I and the French speakers wished each other much bonhomie, but had a certain lack of savoire faire with each other’s linguistics). So sketching and people watching opportunities abounded. It was like my own secret club of observation with four course French cuisine. I saw the Garonne river, the Dordogne river, and the Gironde estuary all the way to the Bay of Biscay – can you imagine, the Bay of Biscay! I like those words a lot. Ate mussels one night in one of the little riverside villages, a big bowl of moules, with cheese smothered French bread and a can of Kronenbourg beer in a local lady’s front garden for eight euros. Perfection! Sending hugs to my friend MAM. oh jane that sounds so divine. i’m imagining both of us retired and off on a river adventure TOGETHER. now won’t that be fun! absolutely love your descriptions – thanks for that! I’m afraid I won’t be going to England anytime soon and I’m sad about that. I haven’t really been working on my travel journal or my Blurb photo book. It’s just been a crazy summer and looks like craziness might continue into fall. I’m happy to hear you’re returning to Venice! thanks sandra! i need to do a blurb book of germany… when i’ll have time who can say? Cider With Rosie was a book I first read when I lived in England in the late 60s and early 70s. My town library there was an eyeopener to me with all the new authors I’d never knew. Laurie Lee became one of my favorites and I’d scan the shelves each week to see if there was another of his books. (life before the internet etc etc) I think Cider with Rosie captured some of the essence of England for me in those years that were not so recovered from WWII as we were in the US. The war years were still very fresh for people who had been attacked. And Venice! I too would love to go back in the winter but my sugarplum of a husband moans…too cold, too rainy. Someday perhaps. a bit of mist and rain yes, with biting cold… but also glorious sunshine and mild weather. Your fabulous journal! It makes me feel nostalgic for Bavaria and that way of life. I liked going into one of those pine tree ‘cures’ where you walk under pine trees with water constantly sprayed over them. The scent is wonderful and apparently very healthy. So glad you’re enjoying Cider With Rosie. L Lee was a traveller, like you, Mary Ann. It’s lovely to know there are other books by him about his journeys through pre-war Spain – before development took over those wild mountains. thanks to you for telling me about him. i gasp aloud at some of his lines. such descriptions! We are going to Venice (and Rome and Florence) in October. I wish I had a copy of your book! I’ll never forget your description of your winter visit. I can’t believe it’s been six years! i think autumn must be a FINE time for a visit! happy for you! MaryAnn, I am so thrilled for you and your upcoming winter trip to Venice. I so enjoyed following along the first time! I can’t wait! I know I’m not the only one either! Your anticipation and research with all that entails will be a delight for you also. oh leslie thanks. i remember with fondness sending out the digital postcards every day of my trip. it was such a joy to have you guys along for the ride. A Room With a View is one of my all time favorites. Think I’ll have to dive into it again. Howard’s End is quite delightful as well. i’ve never read it and am really loving so far!!! Wow! Now that was worth the wait. Beautiful.